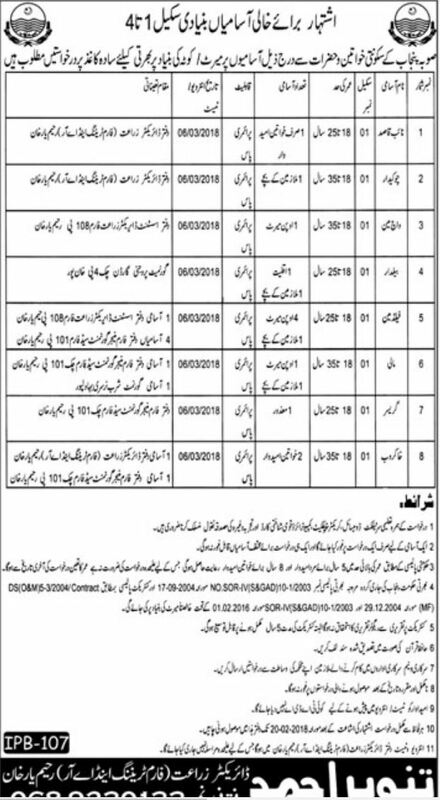 Agriculture Department Jobs 2018 in Daily Khabrain Newspaper on 01/02/2018. Jobs titles are as follows, Naib Qasid, Chowkidar, Watch Man, Baildaar, Field Man, Maali, Gracer, and Sweeper. Interested Candidate can apply for these New Punjab Government Jobs 2018. These jobs are on Contract basis for the period of 05 Year. Interview/Test will be held in the office of Directorate Agriculture Punjab (Farm Training and A.R) R.Y Khan.